The valuation and trading of wool has been revolutionised by the introduction of objective measurement implemented through standardised pre-sale testing of raw wool. These objective methods replaced the traditional visual appraisal methods which had been used for as long as wool had been traded. Objective measurement provided the basis for accurate communication that opened the way to greater integration between the growing and processing sectors of the global wool industry, increasing the efficiency of exchange of ownership and ensuring that processors received wool which was fit for purpose. With the development of sale-by-sample, it was no longer necessary to conduct wool selling functions where the wool was stored and this enabled the industry to introduce major cost-saving reforms in wool handling. In 1972, Mitchell McKenzie, Chairman of the wool industry’s Objective Measurement Policy Committee, stated that: ‘ The objective measurement investigations in Australia over the past two years brought the technological and commercial sectors of the wool industry together on a scale never before achieved’. Many of the developments required for the implementation of large-scale objective measurement were the result of pioneering research at CSIRO, conducted in collaboration with key players in the industry. This research has provided an enduring economic benefit to the wool industry and to Australia. Prior to the implementation of objective measurement, the marketing of wool involved subjective ‘hand and eye’ methods of valuation and an open cry auction system. 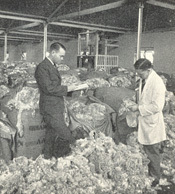 The wool buyers used subjective judgement of individual bales to assess the quality of the wool (fibre fineness and strength) as well as the yield ‘ the percentage of the greasy wool that will be clean wool fibre after the dirt, suint, grease and vegetable matter have been removed in processing. This necessitated expensive storage space and large showfloor areas with a thousand and more bales of wool on display. It also involved time-consuming and costly handling and inspection of wool lots by both brokers and buyers. This traditional procedure operated in every wool-selling centre of Australia and was generally regarded as mysterious but highly effective. Apart from general monitoring, however, there was virtually no attempt at a critical examination of the methods used, principally because the processor always reserved the right to claim compensation for any shortfall arising during early-stage processing. A number of scientists of widely varying disciplinary backgrounds made significant contributions to introducing more scientific methods to the industry. Geneticists such as Helen Newton Turner (CSIRO Division of Animal Genetics) and her colleagues sought to apply population genetics to sheep selection and focused their attention on the fleece and fibre characteristics that were of importance to the processor. Rather than rely upon the subjective terms like ‘quality number’ and ‘style’, as used in wool valuation, she sought objective information such as mean fibre diameter and staple length. Attempts to encourage sheep breeders to take up selection based on such characteristics met with little success at the time. In 1953, Arthur Dunlop (CSIRO Division of Animal Production) and Norman Roberts (CSIRO Division of Textile Physics) pointed out that the relationship between quality number ‘ used in subjective assessment and based predominantly on staple crimp frequency ‘ and fibre diameter was not very strong, although fibre diameter had long been recognised as the major determinant of spinning performance. In this view, they had strong support from Roy Lang of the Gordon College of Textiles in Geelong, who had studied these relationships for many years, and Menzie Lipson (CSIRO Division of Textile Industry), who provided further support with processing trials. Although this information was published, it did not appear to make any impact on wool production, wool commerce or early-stage processing. Professor Pat McMahon (Foundation Head, School of Wool Technology, University of NSW) had long promoted the need for research into wool marketing and had long suggested that the valuation of wool amounted to matching sale lots of the same appearance together and relying on the law of averages to produce the same processing result from year to year. He also suggested that wool classing was aimed at producing sale lots of uniform appearance to facilitate valuation rather than to reward the wool grower. These concepts were put to the test in the 1960s by his students and their findings were vigorously promoted to the Wool Trade. The first official testing of greasy wool commenced in the United States in the late 1930s, when the US Government decided to levy import duties on wool fibre and it was necessary to determine the clean wool content for this purpose. The Australian Wool Testing Authority was established in 1957 by the Commonwealth Government, in response to requests from Australian exporters, supported by technical advice from CSIRO. Following the formation of the Australian Wool Board in 1962, AWTA was reconstituted as a separate Division within that organisation in 1963 and it retained the same status when the Australian Wool Corporation was formed by the amalgamation of the Australian Wool Board and the Australian Wool Commission on 1st January, 1973. AWTA’s initial focus was on testing semi-processed, scoured and carbonised wools for moisture content, so that export sale weights could be adjusted to the international standards of moisture regain. In the late 1950s-early 1960s, Dr Alec Dixie (Foundation Director of Australian Wool Testing Authority) developed manual pressure core sampling tools and basic testing equipment and in 1960 the Division of Textile Physics began its research into better testing methods. For the early-stage processors, it developed the CSIRO Conditioning Oven for measurement of moisture content/regain to certification standard and complemented this with the CSIRO Rapid Regain Tester, specifically designed for quality control within scouring and carbonising mills. However, the main focus of development was on testing of greasy wool. The ultimate objective of this greasy wool program was to develop an automated testing line of equipment, whereby a representative core sample could be fed into an automatic washer, chopped to facilitate centrifugal separation of the wool fibre from the vegetable matter, with automatic drying and weighing of the components and, finally, the computerised production of a Test Certificate. Wool yield was an important characteristic, as nearly one-third the weight of an average bale of greasy wool is made up of grease, dirt and vegetable matter and the amount of these impurities is difficult to assess. After several years of trials and development, the Division of Textile Physics produced an automated washing-machine for testing samples. The difficult process of testing for vegetable matter presented a greater challenge. Most of Australia’s clip is contaminated to some extent with vegetable matter, such as grass seeds and burrs, and the cost of processing is influenced by the amount and type of material to be removed. The conventional test method dissolves the wool in hot caustic soda which also attacks the vegetable matter, requiring standard correction factors to be applied. The CSIRO prototype machine was devised to separate wool fibre from vegetable matter by chopping the washed core sample, immersing it in a liquid in which wool floats and cellulose sinks while spinning the liquid in a centrifuge. However, this was abandoned when it was found that variations in the composition of vegetable matter defeated the density separation concept. Post sale testing, initially for yield only and then for yield & fibre diameter, was taken up by the wool exporting trade in the early 1960s, but these services grew rapidly and soon became the major segment of AWTA’s business. By 1969, AWTA was testing over 1M bales for both yield and average fibre diameter. Export consignments were tested after sale at the buyer’s request. They were composed of up to 50 individual grower sale lots, which meant that the woolgrower received no specific information on the characteristics of the wool he had produced. From a practical point of view, this level of demand for sampling and weighing prior to shipment was creating a huge wool handling cost that could only be avoided if wool was tested pre-sale. There was very strong opposition to change from wool valuers, who argued that their appraisal was accurate and that fibre diameter could be gauged to a fraction of a micrometre! Throughout the 1960s, large databases concerning the relationship between subjective appraisal and objective measurement of individual grower’s sale lots were established, principally by teams from the University of NSW (Ken Whiteley) and The Bureau of Agricultural Economics (Bob Whan). The BAE was also involved in extensive work on commercial aspects of clip preparation and early stage processing. The results of these studies were quite explosive. The range of average fibre diameter among sale lots of the same visual quality number was commonly ±5 µm or more, which was comparable to the mean fibre diameters of the entire merino range i.e. strong wool (23-24.5 µm), medium wool (19.6-22.9 µm), fine wool (18.6-19.5 µm) and superfine wool (15-18.5 µm). Among sale lots of the same appraised yield, measurement revealed differences of ±12% or more from the measured result. It was becoming clear that, in focusing their appraisal efforts on visual uniformity, the Trade was unaware that they were achieving the opposite result in terms of objectively measured characteristics and processing mills were not able to optimise their performance efficiency. The obvious solution was to test individual grower lots prior to sale. This suggestion was ridiculed on the basis of the immensity and cost of such an operation, until it was realised that the major costs lay in accessing, weighing and sampling the bales ‘ costs that would continue to increase with post sale testing. A simple solution was to sample bales on receipt into store, where handling and weighing costs were already being incurred and would not be duplicated. In 1969, the Australian Wool Board formed two Committees to examine the proposal for a selling system based on a test certificates for yield and average fibre diameter and a display sample. The senior committee, the Policy Committee, comprised leading members of the Trade with only one technical member (John Downes, Chief, Division of Textile Physics), who was also the Chairman of the Technical Committee. The Technical Committee was made up of both commercial and technical representatives, who identified areas requiring investigation and quickly drew up an ambitious plan named the Australian Objective Measurement Project (AOMP) that involved a nation-wide program of public displays coupled with research trials. evaluate new methods of clip preparation and ‘sale by separation’ i.e. sampling in one location and selling in another. As part of this project, the Division of Textile Physics designed a machine that grab-sampled bales, making accurate measurement of staple length possible, and another machine that core-sampled bales by boring through the bales full length to obtain a representative sample of the contents for yield and fineness testing. In addition, Leo Lynch and Neville Michie (CSIRO Division of Textile Physics) developed a rapid technique for fibre diameter measurement, including distribution data, in 1972. It was called the Fibre Fineness Distribution Analyser (FFDA). Having defined the research and development scope of the AOMP, the Technical Committee was disbanded and some of its members joined an expanded Policy Committee. Bruce Mackay was seconded from the Division of Textile Physics to create and manage a team of 30, whose task was to set up the trials and displays as required by 9 research working groups. The project was completed in 2 years with 22 ‘Sale by Sample’ displays involving 18 000 bales of wool. It had been a stunning success. As the Australian Objective Measurement Project was drawing to a close, AWTA launched a major investment in laboratories and equipment, in readiness for the commercial system of ‘Sale by Sample’ and test certificate that was initiated formally in 1972. By 1980, almost the entire clip was being measured for yield and fibre diameter, with increasing discounts being applied to lots that were sold without such measurements. There were immediate, substantial cost savings in labour and space for the selling broker and valuation was greatly facilitated for the buyer, who could now meet his clients’ specifications with great precision. The topmaker received a combined test certificate on which the test results for every sale lot in the consignment were reported. The Australian Wool Testing Authority (AWTA), under the direction of David Ward, expanded, automated and computerised its activities very rapidly and by 1988-89 it was testing more than 700 000 sale lots per annum. David Ward is Colin Ward‘s brother and was a graduate of Pat McMahon’s School of Wool Technology, UNSW. David worked as a junior scientist with Jim James on objective measurement at the Division of Textile Physics in Ryde from 1964 to 1965, before taking up the appointment of Greasy Wool Supervisor at AWTA. He was appointed AWTA Director in the following year and remained in that CEO position until his retirement in 2001. He oversaw the development of AWTA from a small operation, conducting 1 500 tests p.a., which grew 1 000-fold to become a major national facility. Jim James and ‘Dave’ David (Division of Textile Physics) provided expert analysis of the mass of data accumulated from surveys and international laboratory round tests on the accuracy of the measurement systems and the establishment of sampling schedules that greatly facilitated the standardisation of new methods and international acceptance of the new selling system. Murray Andrews (Assistant Chief, Division of Textile Physics) played a major role in the evaluation of the grab sampling procedure. With all the major characteristics measured, AWTA, CSIRO Division of Textile Physics and the Australian Wool Corporation became partners in the TEAM project, chaired initially by Murray Andrews and, later by Sas Douglas (AWTA) to work on ‘Sale with Additional Measurement’ covering the major characteristics of staple length and strength. The Division of Textile Physics initially developed research instruments for measuring staple length and staple strength separately and, subsequently, merged the technologies to produce the Automatic Tester for Length and Strength (ATLAS). The ATLAS instrument was introduced into commercial testing by AWTA in 1985 and is now applied to 85% of fleece wool in the Australian clip. These additional measurements of staple length and strength enabled mills to make accurate predictions of the mean fibre length and distribution of wool top and the amount of comb waste (noil) resulting from processing the greasy wool. In the 1990s, at the instigation of Ken Whiteley, who had become Chief of the Division of Wool Technology, a team was established at the Division’s Ryde Laboratory including Tim Dabbs, Monty Glass, Bill Humphries Chris Cantrall, Phil Irvine, Mick Bow and Hendrik Van Schie to develop CSIRO’s Fibre Fineness Distribution Analyser (FFDA) to a stage where it could be used in commercial testing. This team made some significant improvements, which resulted in the Sirolan Laserscan instrument. This is now the standard procedure for measuring fibre diameter and its distribution for the entire Australian wool clip. It also provides measures of fibre curvature and a ‘comfort factor’ based on the percentage of coarse fibres (> 30.5 µm) in the fibre diameter distribution. An on-farm instrument incorporating Laserscan was introduced in the late 1990s by Dr Kerry Hansford (CSIRO Division of Wool Technology) for the real-time, in-shed measurement of fibre diameter and its variability. This instrument called Sirolan Fleecescan® is used for sheep selection and classing, thus realising the dream put forward by CSIRO’s Helen Newton Turner some 50 years earlier. In the 2000s, an automated instrument was developed by Don Ramsay and Graham Higgerson (Division of Textile and Fibre Technology, Geelong) for detecting dark fibre in raw wool, based on computerised image analysis techniques. Dark fibre contamination had become an important issue, due to the importation of meat sheep breeds which shed dark fibre, thus potentially damaging the reputation of Australia’s merino wool clip. The test uses a refractive index matching fluid to make white wool transparent, revealing only the dark or medullated fibres, which are scanned and computer analysed to provide a detailed report of the dark or medullated fibre content for the Australian wool industry. This method has been taken up and further automated by AWTA Ltd and is now used to certify the level of dark fibre in a sale lot, thus protecting the low contamination reputation of Australia’s wool clip. Whereas the original tests for dark fibre contamination used by AWTA were manually based and costly, the new technology has slashed costs by around 70% and has reduced the turn-around time for pre-sale tests commissioned by woolgrowers. In summary, the research carried out by CSIRO, in conjunction with the various wool industry bodies and AWTA, led to the introduction of pre-sale objective measurement that has revolutionised the logistics and valuation procedures used in the international trading of wool. It has provided an enduring benefit to the wool industry and the Australian economy. Virtually all Australian wool is now measured prior to sale. Wool is prepared for sale according to objective rather than subjective clip preparation standards, with some growers preparing classed lines on the basis of individual fleece measurements. Grab samples of the wool are generally displayed for sale in sample boxes, rather than showing a proportion of bales on showfloors, and wool is valued and bought with the aid of actual measurements for fibre diameter, yield, vegetable matter content, staple length and strength. Dark fibre risk and colour tests are also used and coefficient of variation of fibre diameter is available. Measurement has also facilitated computerisation and the expansion of electronic data processing and market reporting. The establishment of auction and individual clip databases provides unparalleled and exhaustive information to all segments of the industry, with each having equal access to that information on a commercial basis. To-day, wool processors can confidently expect that wool purchased to their price and processing specifications, with the benefit of AWTA Ltd certification, will perform to their requirements, and growers are assured of being paid according to the objective specification of their wool, thereby receiving accurate price signals to improve the profitability of their enterprises. Humphries W, 2009, Personal communication. Ward DJ, 2009, Personal communication (from AWTA). Whiteley KJ, 2009, Personal communication.